The many developments described above finally culminated in the publication of two crystal structures of the p2AR in 2007, followed by the structure of the p1AR in 2008. It is fitting and not surprising that the p2AR proved to be the first nonopsin GPCR to be crystallized. p2AR has been the prototypical GPCR since its cloning, based on protein sequencing of the receptor purified from native tissue in 1986 . Many of the methods originally developed for purification from native tissue, such as the alprenolol affinity column  . were also used in the isolation of pure protein from recombinant systems required in the crystallization. A thorough understanding of the receptor, which came from years of single-minded study by researchers such as Robert Lefkowitz [196, 197] and Brian Kobilka [198, 199], paved the way for strategies to modify the receptor sequence to facilitate crystallization. A further reason behind p2AR being the first receptor crystallized (and indeed cloned) is that it is inherently more stable upon purification than most other GPCRs. It therefore remains to be seen whether the strategies for solving the p2AR structure will be transferable to other less stable or poorly expressed GPCRs. The first structure of the p2AR in complex with the partial inverse agonist carazolol was obtained using a monoclonal antibody, which binds to the third ICL as described above [ 3]. This structure had a relatively low resolution (3.4/3.7 A) at the cytoplasmic ends and in the transmembrane domains, while the extracellular regions could not be resolved. Nevertheless, it was clear that the overall structure was, as expected, very similar to rhodopsin. This was closely followed by a much higher resolution (2.4 A) structure of an engineered p2AR in which the unstructured sequence in IC3 was replaced with the sequence from the enzyme T4L  to form a fusion protein (p2AR-T4L), again crystallized in the presence of carazolol. The high-resolution structure of p2AR demonstrated its remarkable similarity to rhodopsin with respect to the arrangement of the helical bundles. As might be predicted, the largest differences were observed in the helices contributing to the ligand binding site. For example, TM3 and TM5 contain the catecholamine binding residues and are the most conformationally shifted. In p2AR, TM3 pivots out of the ligand binding site and has a 4A displacement relative to rhodopsin at the cytoplasmic end, while TM5 is closer to the binding pocket. Another major difference is in TM1, which, in p2AR, is shifted by 7 A at the extracellular end. This results in a wider opening at the ligand binding site. The entrance to the ligand binding site is also altered in p2AR when compared to rhodopsin in that there is no "cap" formed between the N-terminal domain and extracellular loops. Instead, the second extracellular loop forms a short a-helical structure, which sits separate from the transmembrane domains and is stabilized by both an intra-loop disulfide bond and a disulfide bond between the loop and the top of TM3. This helical structure of p2AR is positioned so as to allow access to the ligand binding pocket from the extracellular environment. 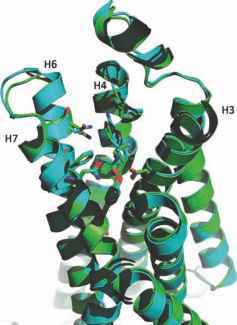 The carazolol binding site in p2AR is located in a region corresponding to the retinal binding site in rhodopsin. Interpretation of the conformation of the receptor associated with binding of carazolol in the T4L fusion protein is complicated by a number of factors. The T4L fusion appears to tilt the equilibrium of at least part of the receptor into an agonist..ike state . 142]. This is seen as an increase in the affinity of agonists and partial agonists, such as isoproterenol and salbutamol, compared to the wild-type receptor. In contrast, the affinity of antagonists is unchanged. This may be due to the T4L protein essentially forcing the bottom of TM5 and TM6 into the more open position normally observed in the active state. Such a change would be expected to cause constitutive activation of the receptor; however, this cannot be determined in the T4 fusion proteins since introduction of the lysozyme prevents G protein coupling. Instead, the authors used a fluorescent probe attached to Cys265 as a reporter for ligand-induced conformational changes. Data from this reporter system supported the fact that the introduction of T4L resulted in a constitutively active mutant (CAM)-like receptor that could be further activated by agonists. Under normal conditions, p2AR shows some basal activation, and, in these systems, carazolol behaves as a partial inverse agonist reducing basal activity but not resulting in a fully "off" receptor. This is analogous to 11-cw-retinal-induced conformation found in the dark state of rhodopsin. However, in the p2AR-T4L structure, the ionic lock found in the dark state of rhodopsin is not found, as TM3 and TM6 are further apart, and the salt bridge between these helices is unable to form. Since p2AR was the first receptor to be crystallized after rhodopsin, it was not immediately clear whether the broken ionic lock was due to the partially active state of the receptor, an artifact of T4L fusion, or a difference between rhodopsin and other receptors. As seen in the rhodopsin structure, the p2AR also contains an array of water molecules, which provide a network of hydrogen bonds, from the base of the ligand binding pocket through to the cytoplasmic face of the receptor. This network is postulated to play a role in propagating conforma-tional changes, from the ligand binding site to regions involved in G protein coupling. The T4L approach was also successfully used to produce a co-crystal structure of p2AR with the beta blocker timolol . This receptor was thermosta-bilized by the addition of a single point mutation (Glu122Trp). A particularly interesting feature of this structure was the presence of two cholesterol molecules bound to the receptor. Although cholesterol molecules were also found in the first structure, the biological relevance of these was questionable as they could have been an artifact of crystal packing. In the timolol structure, the receptors were packed as monomers in an antiparallel orientation but still retained two distinct cholesterol binding sites suggestive of a physiologically relevant interaction. It is known that cholesterol hemisuccinate (CHS) has a stabilizing effect on detergent-solubilized p2AR. In the timolol p2AR structure, two molecules of cholesterol were found bound to clefts formed by TM1, TM2, TM3, and TM4. The interactions on TM4 may represent a highly conserved cholesterol binding consensus motif since Trp158 (^"using the BallesterosWeinberg numbering system)  is one of the most highly conserved residues in Family A and is involved in an interaction with the sterol ring of one of the cholesterol residues. Other residues that are conserved and involved in cholesterol binding, which may contribute to a consensus motif, are Arg151 (439-443R or K), Ile154 (446I, V, or L), and Tyr70 (241F or Y). The recognition that thermostability is one of the most important factors governing purification and crystallization of GPCRs culminated in the first crystal structure of the p1AR . This receptor contained the six-point mutations identified by Serrano-Vega - 136] and described above, which allowed crystallization of the receptor bound to the antagonist cyanopindolol in octyl-thioglucoside. Modifications of this receptor resulted in a protein that had an antagonist-stabilized conformation as defined by a reduction in agonist binding and a loss of basal activity when expressed in cells. Therefore, the receptor represents a more truly inactive conformation than that of p2AR-T4L. Interestingly, in this structure, as was found in p2AR-T4L, the ionic lock is broken, suggesting that although inactive, the state of this receptor is not equivalent to that of dark-state rhodopsin. Overall, the structure of the stabilized turkey p1AR was very close to that of p2AR, with which it shares 67% of identity in amino acid sequence in the transmembrane domains. 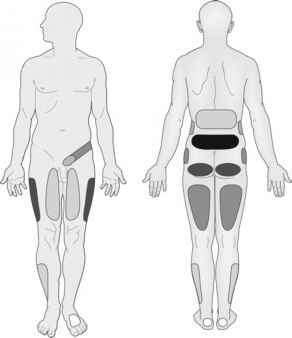 This similarity was encouraging from a technical point of view as it demonstrated that the two markedly differing approaches resulted in similar structures with no evidence for changes in backbone conformation due to the mutations or T4 fusion. The structures of the extracellular loops were also similar between the two receptors. In the p1AR structure, a sodium ion binding site can be observed at the end of the second extracellular loop, which may help to stabilize its helical conformation. The ligand binding sites in p1AR and p2AR are highly conserved, and the 15 residues involved directly in the binding of cyanopindolol to p1AR are identical to those involved in the binding of the related ligand carazolol to p2AR (Fig. 14.7). Since neither of these ligands is particularly selective for p1AR over p2AR, it is not immediately obvious from these structures how some ligands can be highly selective for one receptor over the other. Such differences may be due to residues around, but not in, the ligand binding site, such as Val172456 and Phe325735 in p1AR, which correspond to Thr164456 and Tyr3087.35 in p2AR. Another significant difference is seen in the amino acids around the entrance to the binding site, which have a different charge distribution and may contribute to ligand selectivity. As well as the residues in the transmembrane domain, there are also contributions to the ligand binding site from the second extracellular loop, which folds down into the entrance of the ligand binding pocket. This region does show differences between the two receptors. It is hoped that as more receptors are crystallized, we will see additional structures with the receptors in complex with more selective ligands and that such structures will provide a more detailed molecular understanding of the reasons for selectivity. Figure 14.7 Comparison of the ligand binding sites of piAR and p2AR showing the close homology between the two receptors and the key side chains involved in ligand binding. The p1AR is shown in blue and the p2AR is in green. role in G protein coupling. The absence of this structure in p1AR-T4L is likely to be due to local perturbations caused by the presence of the T4L fusion.